As is obvious from many of the recipes that I’ve posted here, I really like Quinoa and Lentils. 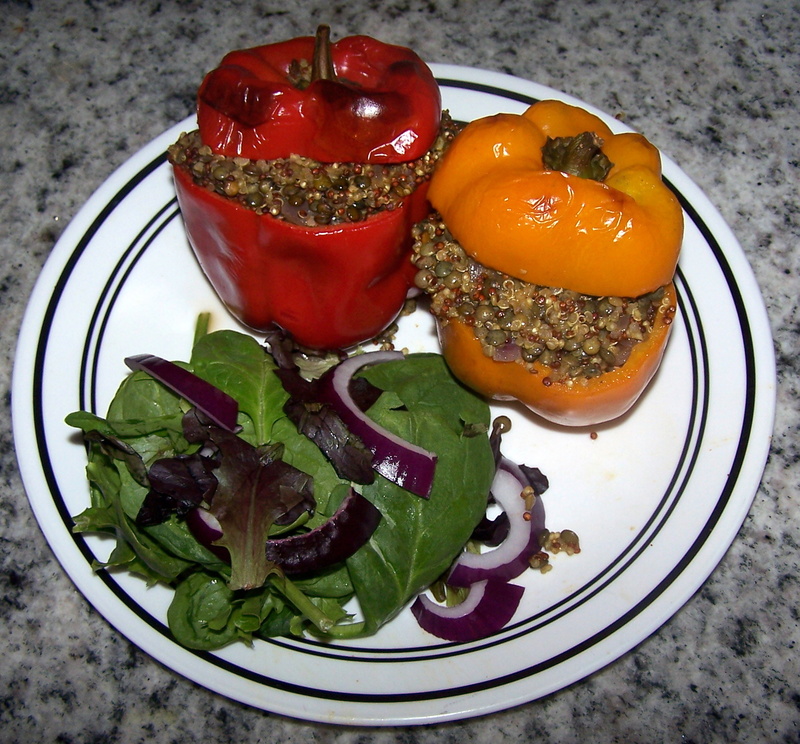 I just saw this “related story” link on the recipe I posted yesterday about the quinoa and lentil stuffed peppers. I checked it out and can’t believe how good this looks. I’m definately going to be making this one soon. Falafel is a great food but it’s not the healthiest thing in the world. I think the preperation here would be a nice alternative for a healthy dinner. I spent some time in the kitchen tonight having fun trying to come up with a new recipe. This is what I came up with. I took some red and white quinoa and cooked them risotto style along with some French green lentils. 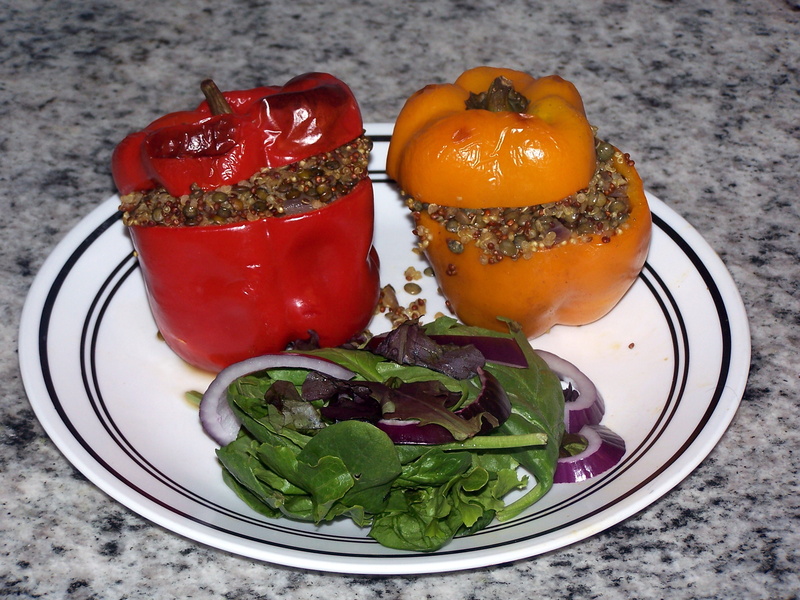 I then stuffed them inside some peppers and baked them at 415 for about 15 minutes and served them with a fresh salad. It was quite tasty. French green lentils are different from the normal brown lentils you find in most locations. I get mine at a local health food store. They have a bit of an earthier flavor to them and hold up their shape and texture a little better when cooking them like this. They are a great addition to this dish because they add a lot of flavor. Begin by soaking the red and white quinoa in a bowl of water. Soak for at least 15 minutes. While the quinoa is soaking, dice the red onion and mince the 3 cloves of garlic. Drain the quinoa and set aside. Heat the olive oil in a 10 inch pot over medium-high heat and add the red onion. Cook until translucent, about 4 minutes. Reduce heat and add the garlic and sauté for another minute making sure the garlic does not burn. Add the quinoa and sauté for a minute making sure to stir constantly to coat all of the seeds with oil. Add the lentils and enough vegetable stock to cover the quinoa and lentils at least 1/2 inch. Return heat to high and bring to a boil. Add the curry powder and boil for one minute. Reduce to a simmer and lightly cover the pot. Let simmer for 15-20 minutes until liquid is absorbed. While quinoa is cooking, heat oven to 415. Cut the tops off of the peppers and remove the cores and seeds. Place the four peppers in an oven safe baking dish setting aside the tops. 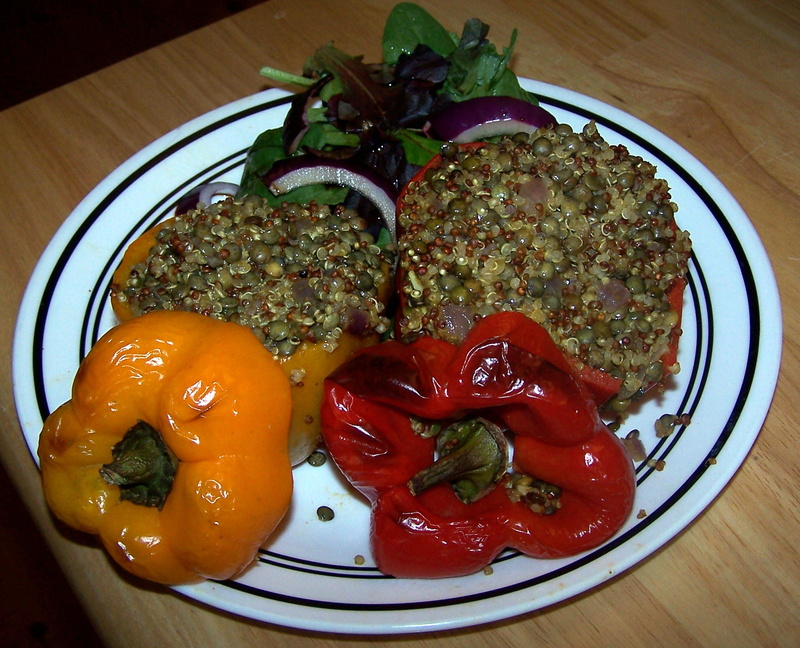 When quinoa and lentils are done cooking and liquid is absorbed, spoon the quinoa into each of the peppers. Replace the tops of the peppers and then bake for 15-20 minutes until the peppers are beginning to brown on the outside. When peppers are done, carefully transfer each pepper to a plate and serve with a salad.